With Jack Frost nipping at your nose, ’tis the season to stay warm and cozy…inside! The cold weather may keep you from all those outdoor improvements and crafts you’ve been wanting to do, but that doesn’t mean you have to lose your creative edge. We now just have a different canvas to play with – the interior of our homes!There’s plenty you could do with rearranging rooms and the never ending lists of DIY crafts, but we’re talking big and bold. Have you thought about painting that certain room and just kept putting it off? If you’ve got some free time and find yourself doing a whole bunch of nothing, then this could be a great opportunity to slap a some new colors up and create a new mood! We’ve just got a few tips and tricks to help you out – from prep works, painting tools, to painting techniques! – Fill any nail holes or other blemishes with spackle and wait for it to dry. – Remove any light switch and outlet covers. – If there are any gaps between the walls and trim fill them with paintable caulk. 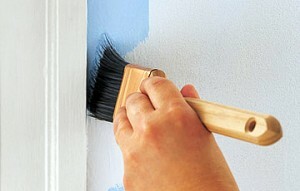 – To avoid paint getting on trim and doorways, use painters tape to create a border in the room. Apply this firmly in short, overlapping strips so you get sharp edge lines. – Make sure you cover your floors with a drop cloth to avoid getting paint where you don’t want it! – If you’re trying to hide dark colors, prime the walls. Primer can help your new paint job last longer. – Stir your paint before you start, making sure all swirls are gone and it looks even. – Your brand is simply personal preference, just know if you find a color you love from a different line the paint store can generally match it in the brand you like. – Choose a finish that makes sense for the room and application. Using gloss, semi-gloss, or other washable paint in areas that are subject to hand prints, smudges, or spatters. Flat paints are more likely to be damaged by repeated cleanings, but they hide surface imperfections better. – Oil or Latex? Latex is water-based paint; it dries quicker and there are less fumes. If you’re painting over oil based paint with latex then you MUST prime first. – If you’re concerned about paint fumes then look for a low-VOC paint (Volatile Organic Compounds). – Remember, the worst thing that can happen if you end up hating the color you chose is that you’ll have to repaint it. Not the end of the world! 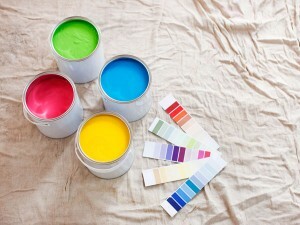 – Many paint companies offer sample sizes, so it’s easier to try the colors you like out before you commit. – Don’t try and stretch your paint; if you don’t have enough come to terms with it. Scrimping will leave you with a patchy paint job. – Hold the brush the narrow way and pull it along your edges to get a crisp line. – The best way to go about painting a room is to cut in first, painting along the trim, ceiling, and corners with a brush. Let this dry then paint the walls with a roller. – Dip your brush about a half inch into the paint, then wipe off one side on the edge of the paint container. – Paint in long, continuous strokes. – When painting with a roller go from the top of the wall to the bottom. – Two coats of paint are better than one heavy coat. The surface will appear smoother, coverage is better, and you reduce the possibility of drips marring the wall’s finish. – Let the paint fully dry between coats. – Use decorating glazes to create a variety of beautiful wall finishes. Sponging, stippling, or splattering glaze over a base coat allows the base color to partially show through. Choose at least two complimentary colors to go over your base color. Allow each color to dry completely before applying additional pigments. These are just a few interior painting tips and tricks to help with your creative visions!